Discussion in 'Guitars in General' started by David Collins, Feb 18, 2008. A picture posted by Hogy in another thread caught my eye, and rather than completely hijack that thread I thought it best to start a new one. 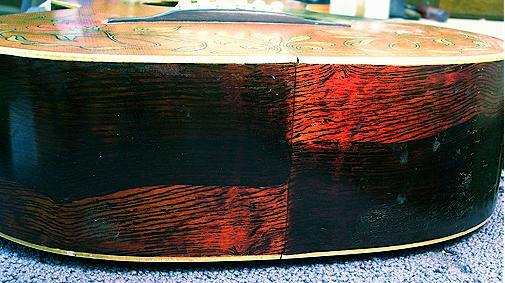 Seems in an effort to make use of narrower boards, Fender briefly tried painting a white base coat and a fake grain under the burst to hide the 5 or 6 piece bodies. 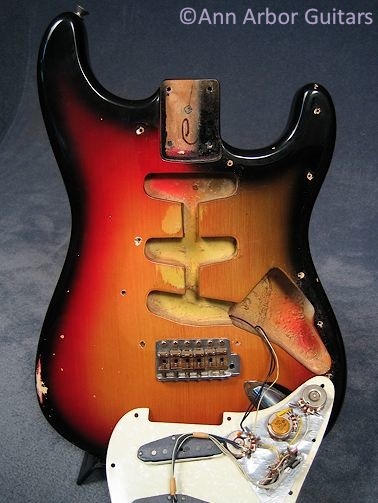 I've heard accounts of this on a few cheaper Fenders before, but have only seen it once on a 1970 Strat. I was at Elderly's when I had this repair come in, and it seemed a bit of a mystery. I talked with Mike Stevens about it, and he had never even heard of this so I figure they can't be too common, and if I recall correctly John English wasn't familiar with it either. I found other accounts of finding this on a few 66-67 instruments, but there's nut much other info about it. Anyway, here's a few shots of the 1970 Strat I took a few years back. Hogy mentioned perhaps offering some photos of his, and I look forward to seeing them. If anyone else has run across this before I'd be interested to hear about it, or even better, get some photos. 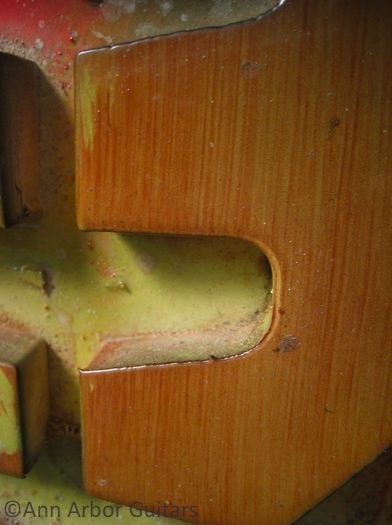 There is one other person, James Shine, who I found with some pics of a 66 Jaguar with this graining that was stripped. There are some shots toward the bottom of the Jaguar page on his web site. Just an odd bit of Fender history I haven't heard much else about. I predict this is going to be a very short thread since you are the only person other than myself whom I've ever heard mention this. It is pretty much unknown. When I had my '70 Strat (I no longer own it), I neglected to take very good pictures of this phenomenon. What little I have mirrors your findings. The body was painted a beige color with wood grain painted on top of that. The fake grain is fine and parallel as if applied with a brush. It looks like spruce more than alder. I believe the use of scrap wood for bodies started very soon after CBS took over. I've posted before about a '66 Strat I used to own which was originally Olympic White. By the time I got it, it had been refinished multiple times. 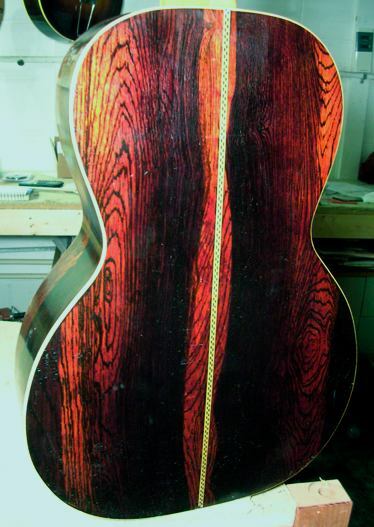 After I stripped it down to prepare for restoration, I foud its body to be made up of seven strips of wood. Incidentally, it was a really good sounding guitar, as was that faux grain '70. Thanks - at least you saved a few pictures. 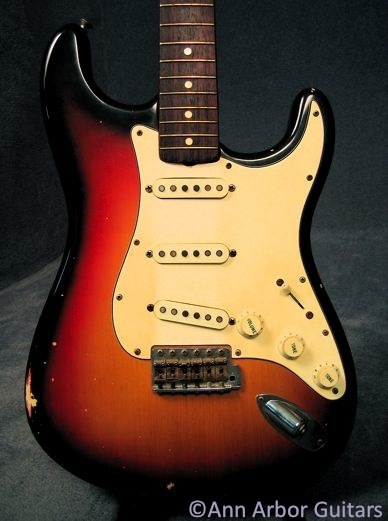 That's the only other Strat I've heard of with this, both from 1970. It was good to see at least one more. I have a late 66, and it does not have this. Never seen it before. I talked to a Masterbuilder at Fender about something similar to this a year or so ago. He talked of a paint job he does that he called "two-tone ash sunburst". 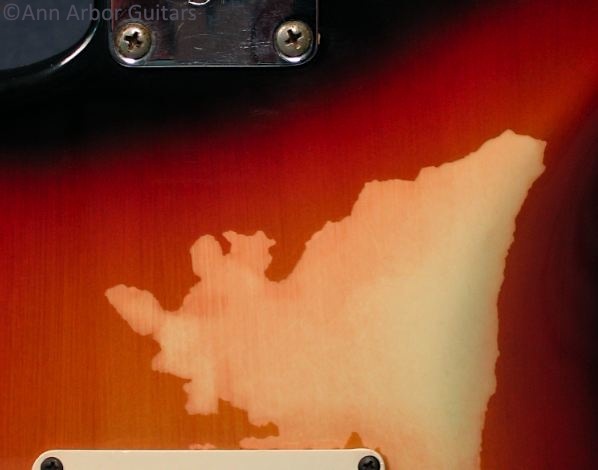 Basically painting grain lines on an alder body to simulate ash wood. For the reason that alder is plain looking, and people like the tone of alder, but the appearance of ash. 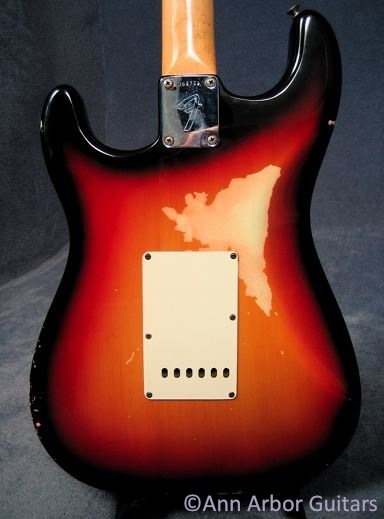 It was kind of neat looking, I saw a Custom Shop Eric Clapton Stratocaster he painted this way. So if it is done now, I'm sure it could have been done back then. Common on cheap furniture. They join bunch of narrow poplar or other low value boards together and base coat it, paint on the wood grain, and topcoat. Truth is, there are probably hundreds of examples of this guitar finish but the average guitarist may not even recognize it as faux. It seems well done from the photos. The interesting part to me about these is how unusual they are on a Fender. After perhaps experimenting with it I assume they must have just found the slight labor cost increase to outweigh the slight savings in materials. You just don't find many people who have ever heard of these. 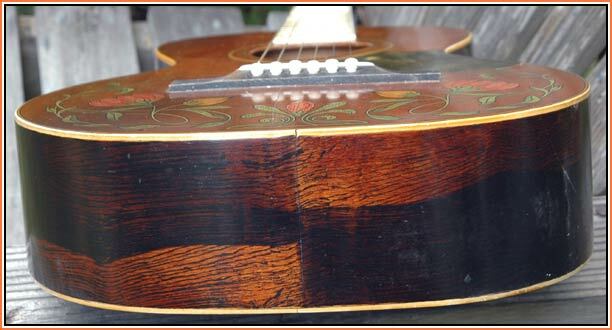 My favorite parlor I have is an old Oahu (made in the Chicago Regal plant) with maple back and sides painted to a fake rosewood grain. 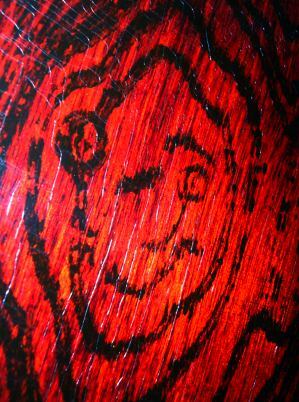 These were fairly common, but I love that someone took artistic license to sketch a little face on mine. The interesting part about this one is that it looks so identical to another Oahu a dealer is selling for $1650, which is listed as solid Brazilian. 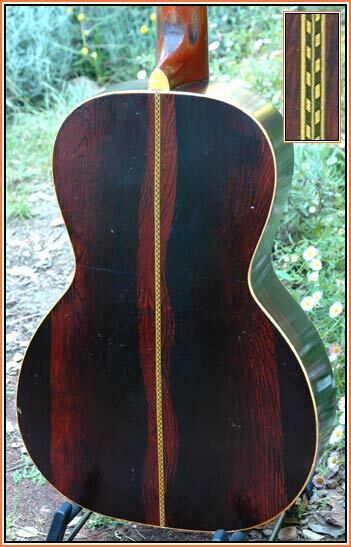 On an acoustic, wouldn't it be easy to just look inside the guitar and see if the grain matches the outside? That's what I do to determine if the back and sides are laminated.